I have no idea when Easter is this year. I am still pretty upset over the downsize that took place in 2007, though. 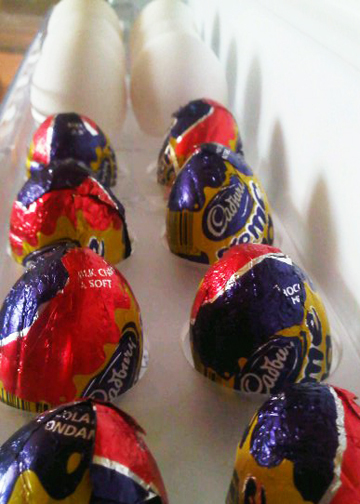 I will forever love Cadbury for giving me the cream eggs, but I’m not forgiving them for screwing me out of 4 grams of unhealthy goodness per egg treat. 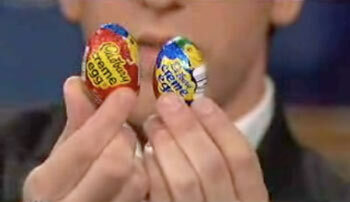 The instant I saw the eggs that year, I knew they were smaller. I recall repeatedly being told I was crazy and that they were still the same size as ever, but I was sure they were smaller. Thankfully, BJ Novak came to my rescue on Conan O’Brien. He apparently had stashed away creme eggs from years gone by so that he would never have to be without them, allowing for the comparison. A tactic I try most years, but unfortunately my stocks have never been large enough to last me past early summer. I used to love these! Some how, I instead became a little more obsessed with peeps over the years.